Just like the plants, the animals in Australia had time to evolve separately from the ones in the other parts of the world. They are quite primitive and many can be seen only on this continent. There is an amazing variety of animals in Australia both on land and in the ocean. The native mammal can be separated into three groups – marsupials (almost half of them, including Kangaroo, Koala and Wombat; the name comes from “pouch” in Latin; a small number of them can be found only in America), monotremes (the only ones who lay eggs, including the Platypus and the Echidna) and placental mammals. Some of the bird species are the Emu and Kookaburra. Did you know that Australia is one of the 17 megadiverse countries in the world? This means that it gets a share of the earth's most biodiverse ecosystems. With the feast of flora and fauna in this country, there's no wonder why it enjoys booming tourism throughout the year. 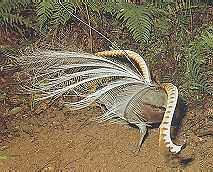 Australia also boasts of having several endemic species of fish, bird, mammals and flowering plants. This means that a lot of these plant and animal species are unique to this country. This is why a trip to Australia is not complete without paying a visit to the Australia Zoo. Located in Queensland, the Australia Zoo was originally a park housing reptiles in 1970. It was named Beerwah Reptile Park and was put up by Bob and Lyn Irwin. Over the years it has changed its name many times. It was renamed the Queensland Reptile and Fauna Park, then later the Crocodile Environmental Park and finally Australia Zoo. From its humble beginnings as a home for crocodiles and other reptiles, it's now a haven for almost every kind of species in Australia, from possums and raptors to tortoises and cheetahs. In 1991, the management of the Australia Zoo was passed on to Steve Irwin, son of Bob and Lyn. The zoo now belongs to Steve's wife, Terri Irwin, who overtook management after her husband’s unexpected death. One of the best ways to maximize your stay in Australia Zoo is to take part in what they call the Platinum Zoo Adventure. This is a package that gives you exclusive animal encounters and other features that not many guests have access to. With this package, you get the exceptional chance to feed elephants, cuddle with koalas and hold a giant python. Also included in it are best seats for animal shows, as well as morning tea and a bountiful lunch al fresco. Bandicoot – a marsupial animal with pointed ears and tapering snouts. It usually lives a solitary life and is nocturnal. Bilby – it is also a marsupial mammal and has longer ears than the bandicoot, silky fur and a long tail with a bushy end. Dingo – it is thought that this native dog was brought here on rafts or boats by the aborigines. In contrast to the nowadays dog, the dingo doesn’t bark, has a different gait and its ears are always pointed upwards. Echidna – this animal is covered in spines, eats ants and lays eggs – only one at a time. It also has a pouch in which the baby is carried after its hatching. The baby leaves the pouch when its spines grow and becomes independent after a year or so. When the echidna is in danger it rolls itself into a ball or rapidly digs a hole into the ground. Kangaroo – this is the most famous of Australia’s animals. 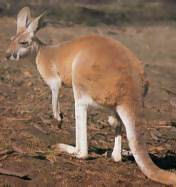 The largest kangaroo species is the Red kangaroo (only the males have that special colour). They eat only herbage or plants and most of them live on the ground where they move by huge jumps, using their tales for support. Kangaroos can travel with up to 65 km per hour and are usually well-tempered. Kangaroos are known for having great stamina, especially when moving at a high speed. One reason behind this is the fact that hopping takes less energy than four-footed running. However, the opposite is true if a kangaroo hops at a low speed. It’s amazing that kangaroos cannot move their feet independently. Instead, they can only move their hind feet together when on land. However, hen these creatures swim, they have the ability to kick each leg independently. In the case of tree-kangaroos, they only have the ability to move their legs independently when they climb trees and other high objects. Like other animals with tails, some species of kangaroos can use their tails to carry nesting materials like small branches and grass. While tree-kangaroos have the ability to climb trees, they cannot wrap their tails around objects. Koala – it usually is very calm animal which live on eucalypt trees and feed with their leaves. They are skillful at climbing but clumsy and slow on the ground. They look for food during the night and sleep most of the day. 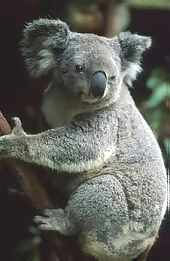 Koalas are with grey fur, leathery nose and rounded eyes. Their babies also grow in the pouch of their mother for about six months after which the mother carries them around on her back for a few more months. Koalas once had many different species. However, all of these species died except for the one left today. Browser, a kind of koala that lived 15 million years ago, was the earliest known member of this family. However, a giant koala two times the size of the one you see today existed 40,000 years ago. Koalas are not family creatures, but solitary animals. They probably hate dealing with in-laws or keeping a big family intact. Make sure not to disturb koalas when you visit their habitat. Remember that these creatures are used to sleeping for about 18 hours a day. Don’t blame them for being sleepyheads for their favorite food eucalyptus leaves makes them sleepy. Platypus – this animal has a duck-like beak, a body covered with fur, flat tail and webbed feet with claws. The male ones have a poisonous spur on each back leg, but no one has died from it. They feel at home in the water – dive and swim perfectly and can stay underwater for several minutes. Wombat – it looks like beaver, has a tail and grey hair. It prefers living on grass, digging its burrow there. While they are still babies, wombats can be tamed and can become great pets.